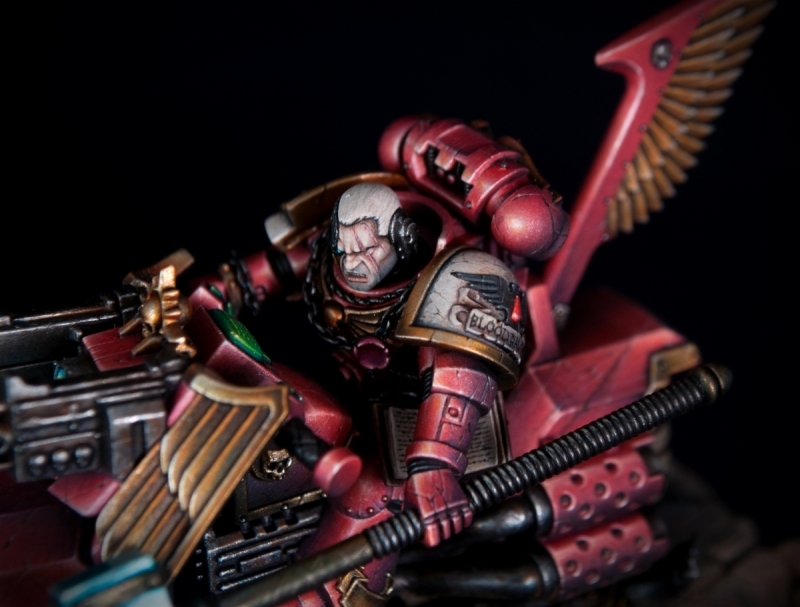 If, like myself, you played Dawn of War a lot when it first came out, then you already know who Gabriel Angelos is. The now Chapter Master of the Blood Ravens was a major character in the first game, had a pretty big role in Dawn of War 2 Retribution, and looks to be making a return with Dawn of War 3. The conversion work on this is pretty spot on, and for me at least, I know who it was supposed to be right away. 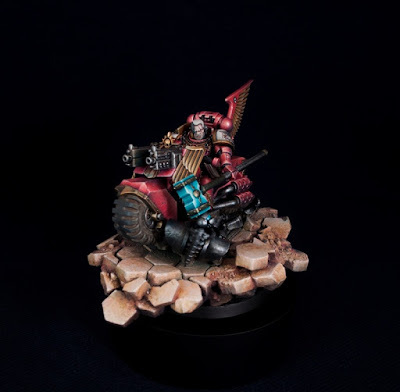 It's rather unique seeing a well done Space Marine on a bike and I really like the little bit of narrative that has been worked into the base. The way the Necron's head is coming apart from the hammer blow is really cool and realistic. The painting is top notch as well, with smooth blending and crisp highlights. The glowing on the hammer acts as a nice focal point, contrasting with the red of his armor. I'm not 100% sure what's going on with the base with the ground coming apart, but it sure does look cool. I don't know what else I can really say about it, it's just a very well done model.